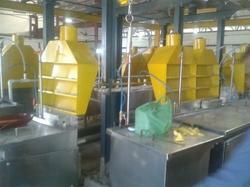 Leading Manufacturer of aluminum casting treatment plant from Pune. We have carved out a niche in related field as a remarkable manufacturer and supplier of Aluminum Casting Treatment Plant. Widely used in automobile, railways and other related industries, these plants are used for surface treatment of aluminum castings. The provided plants are made with the use of premium quality components and latest technology according to defined quality norms. Tested on different parameters of quality, this Aluminum Casting Treatment Plant can be purchased at reasonable prices. Looking for Aluminum Casting Treatment Plant ?